Not vital, but it brings a welcome sense of completion. onfire of the Vanities, the second of Ubisoft's promised expansions to its outstanding title Assassin's Creed II, delivers a solid amount of material for the money. 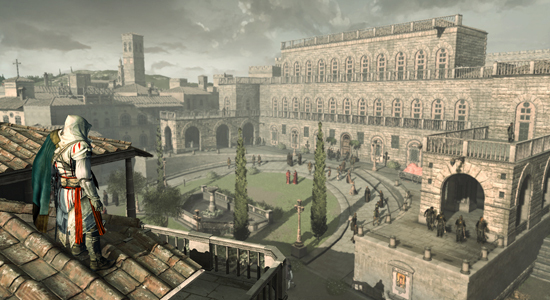 Boasting an additional twelve memories, several new secret locations to explore, and a new acrobatic stunt for our hero's repetoire, Bonfire fills in the final missing pieces of Ezio Auditore's journey to recover a powerful artifact and put an end to the manipulations of those who would exploit it. Although the new content contained in this latest addition is much more substantial than that found in Battle of Forli, it still suffers from the same basic plight; as entertaining as the expansion may be, it is certainly not required to experience the full impact of the storyline as a whole. The plot, carried over from Forli, is simple. Having narrowed down the likely suspects in the theft of the Apple of Eden, Ezio finds the perpetrator nestled firmly in Florence and using the artifact to sway the public opinion in his favor. Nine of the twelve new memories involve the elimination of key lackeys of the man in charge. Ubisoft did a solid job of ensuring diversity in the approach of each target.To its credit, Ubisoft did a solid job of ensuring diversity in the approach of each target, as every assassination relies on a different method of concealment and pursuit to complete. Certain sections required more stealth and planning than were ever needed in Forli, which I was able to complete inside 40 minutes using the most basic brute-force approach. As it happened, Bonfire of the Vanities took me a little more than two hours to complete, including the exploration of the new Templar treasure vaults. The new springboard move failed to impress and seemed to be more of an afterthought than an integral tool with several situations deliberately designed to force its use. Hardly compelling gameplay, here. By the end of the Sequence, the Apple of Eden is of course back in the deft hands of the Assassin and his kin, bringing to a close the small side journey begun in Battle of Forli. With nothing new to show for the extra three hours of gameplay, it's easy to see why Ubisoft chose to leave both Sequence 12 and 13 out of the initial release. Simply put, it dampens the anticipation carefully nurtured by the story arc and bleeds momentum just before the otherwise thrilling climax. For those who found the missing gaps in the timeline of Assassin's Creed II annoying, the sense of completion Bonfire brings will be a welcome one, and will surely be appreciated by the truly committed fans out there. For those to whom money is more tangibly an object, it may not be the most necessary of purchases.